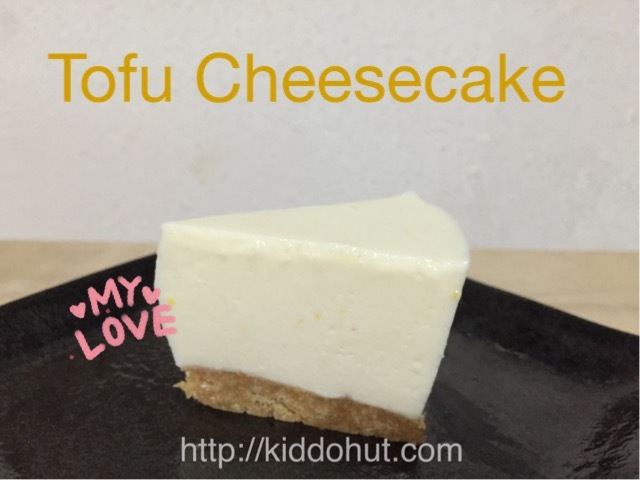 To be honest, I am not really a big fan for Cheesecake but I find the Sun with Moon Japanese Dining’s Tofu Cheesecake is especially appealing. Somehow, I like the texture that is not too wobbly or too sour which many non-bake Cheesecake seems to taste as that. After several tries, finally I get the version of my non-bake Orange Tofu Cheesecake. Actually, there is no need to steam the Tofu which can eat straight from the packaging. Since I am serving my tots this dessert, I prefer to steam it. This steaming of tofu is optional. 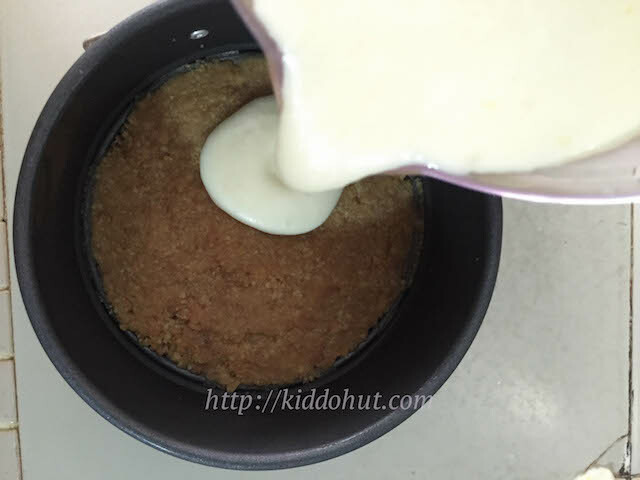 For the biscuit base, you have an option of using oreo biscuits or digestive biscuits or even chocolate wafer biscuits. In fact, I used the chocolate wafer biscuits as the base and toppings as well. It tasted fantastic! 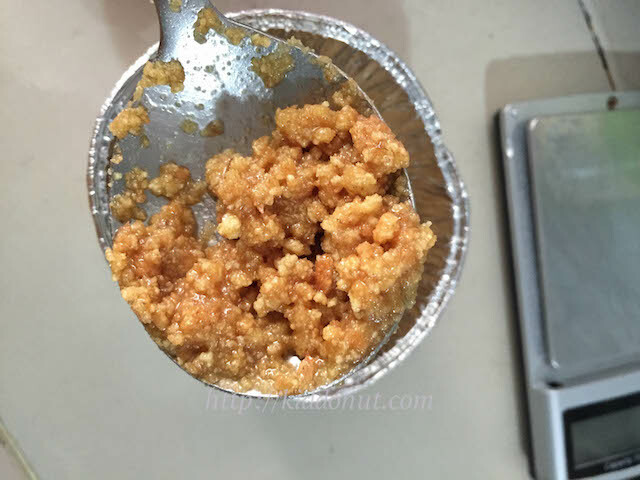 Do use the ingredients in room temperature, and you need to strain or sieve the cheese mixture to remove lumps and air bubbles from the blending (using blender) or beating (using mixer). 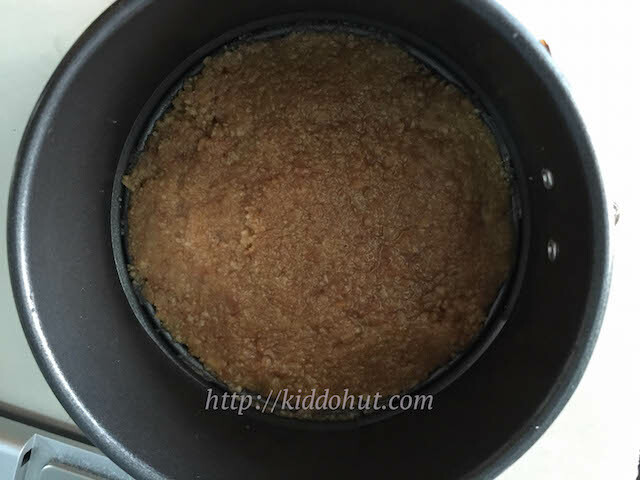 Instead of using one springform pan, I used two mini springform pans plus two tart moulds for this recipe. Cut the cheesecake using the knife dips in hot water to facilitate the cutting. Last but not least, if you do not like the orange favour cheesecake, you can always switch back to original by replacing the 100ml orange juice with 70ml water and 30ml/2 tablespoon lemon juice. 2. 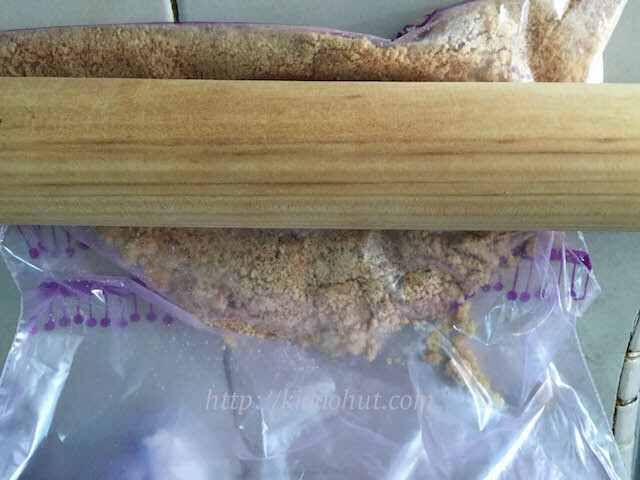 Crush the biscuits by putting the biscuits in the ziplock bag and crush them using rolling pin or bare hands. 3. Melt the butter. Mix the crushed biscuits with the melted butter. Lay them as the base in the springform pan and press hard. Chill it in the refrigerator for at least 30 minutes. 4. Add the gelatine powder into 50ml of orange juice. Stir well and leave it aside for 10 minutes. 5. Put the cream cheese, sour cream, tofu and icing sugar into the blender or mixer, and blend/mix well. 6. Add the balance 50ml orange juice, orange zest and 1/2 teaspoon vanilla essence, and blend/mix well. 7. 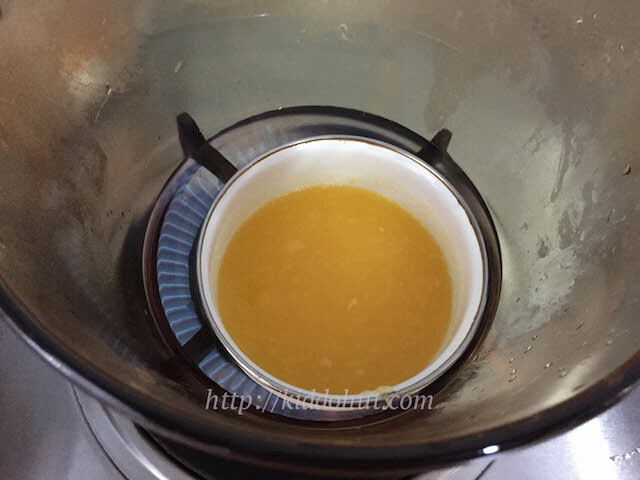 Dissolve the gelatine powder in the orange juice by double boiling at low heat. Stir while double boiling. Off heat when dissolve. 8. Add the gelatine mixture into the cheese mixture and blend/mix well. 9. Strain the mixture through fine-hole sieve. Press the residual through the sieve. Pour the mixture into the chilled base. 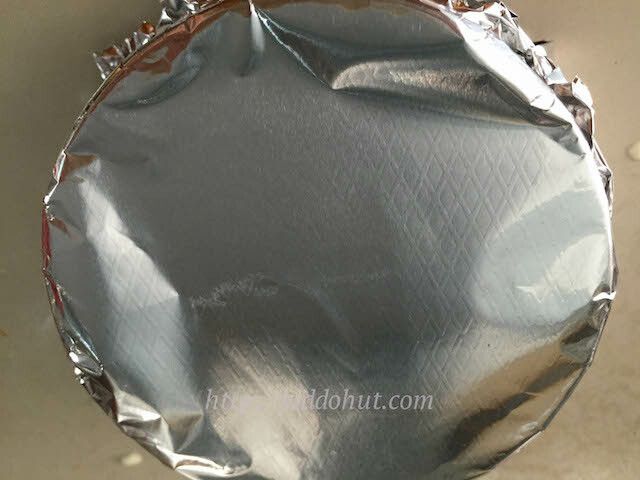 Cover with aluminium foil. Chilled for at least 4 hours. 10. Remove from the springform pan and cut the cheesecake using knife dips in hot water. Serve. 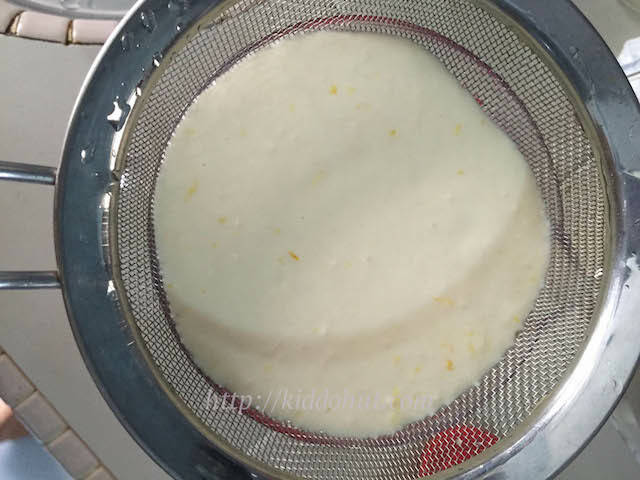 Variation: To make the original Tofu Cheesecake, you can replace the 100ml orange juice with 70ml water (to mix with the gelatine powder) and 30ml lemon juice.